Oscar Movie: "The Lord of the Rings: The Two Towers"
After Boromir (Sean Bean) succumbs to the power of the ring and tries to take it, Frodo (Elijah Wood) and Samewise Gamgee (Sean Astin) have separated from the rest of the fellowship, fearing the ring will corrupt them as well. They head to Mount Doom on their own, but they are not alone. They are being followed by Gollum (Andy Serkis). Frodo and Sam capture Gollum and make him guide them through Mordor to Mount Doom. Meanwhile, the rest of the fellowship are in pursuit of a pack of Orcs who took Frodo's cousins, Merry (Dominick Monaghan) and Pippin (Billy Boyd), thinking they may have the ring. All the while, the evil white wizard Saruman (Christopher Lee) is planning to send an army of Orcs to Rohan to kill all the people and begin Sauron's reign of evil. "The Two Towers" picks up right where "The Fellowship of the Ring" left off and in a fantastic fashion. Since all of the movies were filmed at the same time, it is a seamless transition that needs no re-introduction. When watching these films, it is really hard to separate them because in reality, each one is only a section of a much larger story. None of the pieces can exist on their own and you can't really go into one without seeing its predecessor. Many new characters and places are introduced in this sequel, adding even more depth to the world that is Middle Earth. Much like its predecessor, "The Two Towers" does a great job developing all of these the new characters, as well as diving into some of the already introduced character's back-stories. These "older" characters get more depth in this second installment. For example, Legolas and Gimli start a friendly rivalry of sorts, which provides some good laughs throughout not just this film, but for the rest of the trilogy. These two characters almost take the reigns as comic relief from Merry and Pippin, who are plunged into darker and more serious situations. The bulk of this film takes place in Rohan, a kingdom of men who have been targeted for destruction by Saruman. It is here that the Battle at Helm's Deep takes place, which is an amazing, very entertaining and truly epic battle scene. The film isn't all war, swords, and arrows, though. There are much more personal moments as well, and of course, great acting. Andy Serkis does a fantastic job as Gollum and he has a very memorable scene in which he argues with himself for quite some time. This scene has become iconic in cinematic history. Like before, there are so many great characters, scenes and fantastic performances that it's impossible to mention them all, but Serkis' performance in particular deserves to be singled out since he is never given the proper recognition that he so rightfully deserves by award shows. 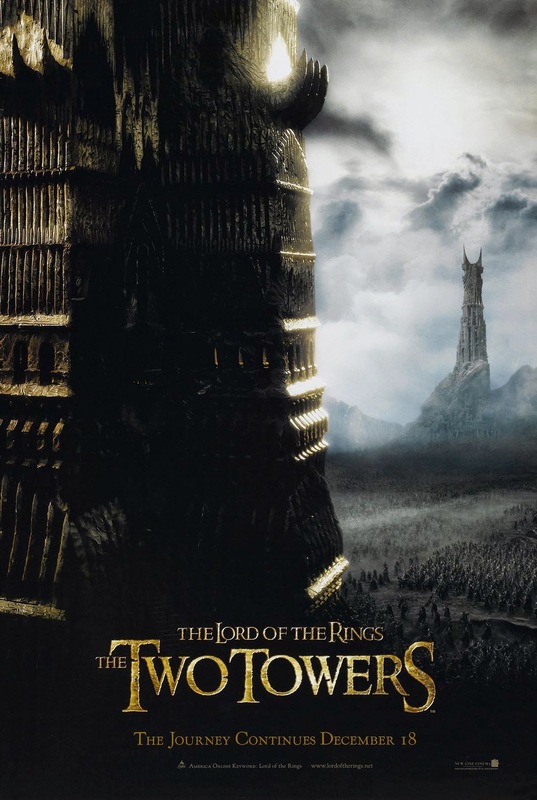 Overall, "The Two Towers" is a fabulous movie in a wonderful trilogy and serves to further the trek to Mordor with a lot of stunning visuals, some truly gripping and perilous situations, excellent development of characters and settings, and a thousand bated breaths until the final chapter.